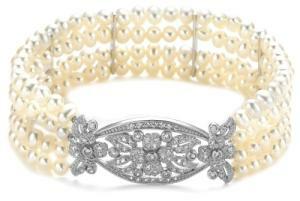 This decorative pearl stretch bracelet is a beautiful formal accent that's so easy to wear. Four strands of small white cultured freshwater pearls lead to a gorgeous filigree marquise center ornament, in sterling silver with a delicate sprinkling of cubic zirconia. The pearls are strung on elastic cord and separated by silver spacers. This lovely design slips over the wrist for instant glamour.